What do Lauren Conrad, Bobbi Brown, Taylor Swift, and Rachel Zoe have in common? They are all style-savvy glamazons who have made strides in the music, beauty, fashion, and literary worlds; and who all play a hefty part in GLAMOUR magazine’s can’t-leave-home-without-it tome 30 Things Every Woman Should Have and Should Know By the Time She’s 30 - a pocket-sized powerhouse of a book that provides one with life lessons in the form of essays from our favorite celebutantes. And now three (3) lucky ladies will have the chance to take home a copy all their own! You guessed it, my loves! Café Fashionista has teamed up with Hyperion Books to bring three (3) ravishing readers their very own copy of GLAMOUR magazine’s latest literary contribution - 30 Things Every Woman Should Have and Should Know By the Time She’s 30. ♥For one (1) entry, leave a comment on this post stating what thing every woman should have or should know by the time she’s 30 between now and Friday, May 18, 2012 at midnight PST. 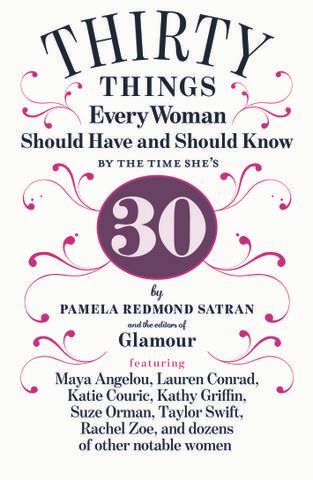 ♥For two (2) entries, Tweet about this giveaway, and leave a comment on this post stating what thing every woman should have or should know by the time she’s 30 between now and Friday, May 18, 2012 at midnight PST with your Twitter URL. ♥For three (3) entries, become a follower of Café Fashionista on Blogger/Google Reader/Google Friend Connect, or Twitter @cafefashionista, and leave a comment on this post stating what thing every woman should have or should know by the time she’s 30 between now and Friday, May 18, 2012 at midnight PST (if you are already a Café Fashionista follower, please say so in your comment). I will randomly pick three (3) names out of a hat (who knows, it could be yours! ), and announce the winners on Saturday, May 19, 2012. Thanks to Hyperion for the picture. I can't believe I'm almost 30! Definitely need this book! how to do some chore that a man usually does...you never know! 1. I think by 30 every woman should have: a great group of girlfriends she can count on for anything, a classic capsule wardrobe and a place (no matter how large or small) in which she calls her own and can truly relax in. Oh I think every woman should wear sunscreen. Everyone should wear sunscreen though, lol. I was just hearing about this book and how good it's supposed to be! I'm a follower via GFC and one thing I thing you should know by 30 is how to live by yourself and appreciate it. Every woman should have self-confidence by the time she's 30! THree great friends - they will get you through everything! Oh, I would totally love to have this book! I think something women should know by age 30 is that it doesn't matter if you didn't become a superstar millionaire in your 20s. The 30s are where it's at. They should also know how to do grown-up things like taxes, change a tire (or fix a disposal). this book really is an inspiration. I hope there are a zillion time saving hints in here because I'd love that.